Does Nizoral Shampoo Cause Hair Loss? Nizoral shampoo is designed to tackle dandruff, but many people use it to treat hair loss too. This review gives four reasons why Nizoral can potentially treat thinning hair and hair loss symptoms. 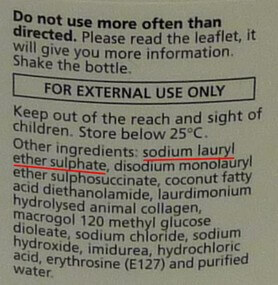 It also reveals that this shampoo might actually cause hair loss as a side effect. 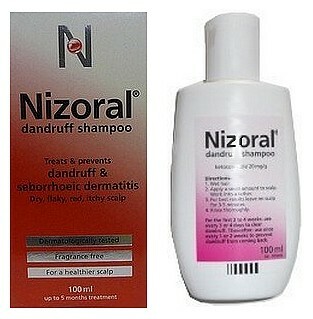 Nizoral is a medicated shampoo which contains the drug ketoconazole. Ketoconazole is an anti-fungal agent, and this is why the main use of Nizoral is for treating dandruff and seborrhea (seborrheic dermatitis) as explained in the box below. It's thought that ketoconazole probably treats dandruff and seborrheic dermatitis by killing off a type of yeast (fungus) called malassezia ovale (formerly known as pityrosporum ovale). This yeast lives quite normally on the skin but can sometimes proliferate, causing severe dandruff. And this is especially true if it has an excess of sebum to feed on. Sebum is what makes hair greasy and is produced by sebaceous glands* within the hair follicles. So, given just how many follicles there are on the scalp, it’s easy to see how the scalp could play host to a yeast feeding frenzy! But, thanks to it's active ingredient ketoconazole, Nizoral is an anti-fungal shampoo. And it's this ability to kill fungus that makes it so effective at treating dandruff. * Note: Sebaceous glands can become especially overactive in someone with hair loss (androgenetic alopecia). That’s because sebum production is related to the amount of DHT present in the scalp follicles (high DHT levels means more sebum is produced). And, since many people with androgenetic alopecia are highly likely to have excessive DHT levels, this explains why many people with hair loss also suffer dandruff. From the box above, you can see that there's a very interesting link between dandruff and hair loss (androgenetic alopecia). So perhaps it's not surprising to learn that ketoconazole can also help people with hair loss. How Does Nizoral Work for Hair Loss? Can Nizoral shampoo regrow hair if it’s not even promoted as a hair loss product? Studies have shown that topical application of Nizoral's active drug ingredient ketoconazole can produce results comparable to minoxidil (Rogaine) with both drugs being at the same 2% strength. 1. By reducing yeast levels in the skin. The body has an inflammatory response to the excessive growth of yeast, and this inflammation can affect hair follicle health. So, by reducing yeast levels back down to normal (as explained in the box above) inflammation can subside and hair growth improved. 2. Ketoconazole is also an anti-androgen. Ketoconazole can bind with androgen receptors and so reduce DHT levels in the hair follicles - something that might help hair grow due to the strong link DHT has with hair loss. 3. Less DHT, less sebum. By binding to androgen receptors, ketoconazole can also address the inflammation issue explained in point 1 above. Basically, if there’s less DHT, there’ll be less sebum too (as explained in the box above). And if there’s less sebum to feed the yeast, this should help control both yeast proliferation and the inflammatory response the body has to it. 4. Less sebum, more hair. In excess, sebum might clog up the follicle roots and contribute slightly to hair loss. So, if there’s less sebum in the follicles, this might also support hair growth. Note: Although high sebum levels, DHT, skin yeast (and the inflammation it causes) might all contribute to the hair loss process to some extent, none of them are its actual cause. I'm convinced that skull expansion is the reason behind this type of hair loss. And I firmly believe it’s only by treating this underlying mechanism taking place that you can fully get to grips with hair loss. And this might also explain why not everyone who tries Nizoral shampoo for hair loss gets a positive outcome, as you’ll see below. Since ketoconazole can act against androgens, it seems likely that Nizoral might best be tried only with androgenetic alopecia (male pattern baldness). However, the disease tinea capitis (i.e., scalp ringworm caused by a fungal infection) can also lead to hair loss which has been successfully treated using Nizoral shampoo. As for other types of hair loss, it’s probably not going to help, but there have been studies on mice which suggest that ketoconazole can promote hair regrowth. And since I’m pretty sure mice don’t suffer from male pattern baldness, it might just be worth a try. Nizoral shampoo has 12 ingredients including sodium lauryl ether sulfate (SLES). This is potentially bad news as it can cause irritation for some people. Obviously ketoconazole is the most important Nizoral ingredient, and the one that sets it apart from any other hair loss shampoo you might be thinking about using. But, remember, ketoconazole is a drug. And drugs can often lead to complications. Changes in hair color and texture. Inflammation of hair follicles* and skin (dermatitis). Itching, blistering or burning sensation of the skin. Increased tear production and irritation to the eyes. Allergic reaction (e.g., swelling of the face, lips, tongue, etc). * It sounds bizarre but the side effects Nizoral shampoo could cause include hair loss - a symptom that Nizoral can be used to treat! When taken as an oral drug, ketoconazole can also cause liver damage. But, this is highly unlikely from the small dose you’d get from a topical application of Nizoral shampoo. Even so, clearly you don't want to use Nizoral any more often than you need to. Studies have shown that effective treatment has been achieved with both 1% and 2% strength ketoconazole shampoo for both hair loss and dandruff when used two or three times per week. In the UK, Nizoral is sold without prescription at a strength of 2% ketoconazole. So, if you were to try this product, perhaps using it just once a week might be enough. There are loads of great Nizoral shampoo reviews. But virtually all of them are from people with dandruff, which is what you would expect really because Nizoral shampoo is not really intended for use as a hair loss product. Other Nizoral reviews mention some of the side effects listed earlier, including an increase in hair loss. So, use Nizoral shampoo and you might run the risk of making your hair loss worse! To help you compare shampoo products and decide which (if any) to use, the final page gives a comparison chart of all three hair loss shampoos reviewed in this section (Alpecin, Nisim and Nizoral) along with four more dedicated hair regrowth shampoo products. This page 3 of 4. Read final page? How to find the best hair loss shampoo. Read previous page? Nisim shampoo review.